Men and women in green tops held their heads and various body parts yesterday evening and danced on the Mahaica Oval ground to Blaxx’s 2012 soca hit. And Guaya United, the Super League upstarts, had whipped Point Fortin Civic 2-0 at the latter club’s home ground to advance to the Toyota Classic semi-final. Photo: Guaya United celebrates a goal from Russell Alfred (second from right) during a Super League triumph over Westside Superstarz in Guaya, three months ago. 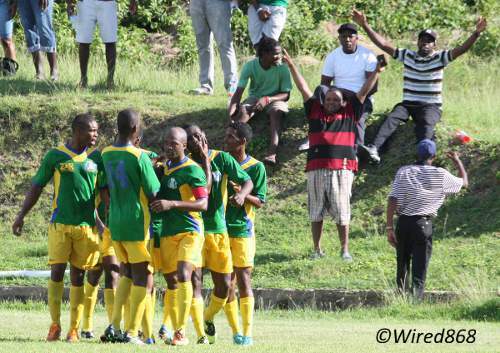 Point Fortin is in second place in the Pro League at present while Guaya is second in the Super League. There is one division and seven league places between the two teams; yet this was no fluke. It was a triumph for tactical discipline, commitment and spectator-driven passion. 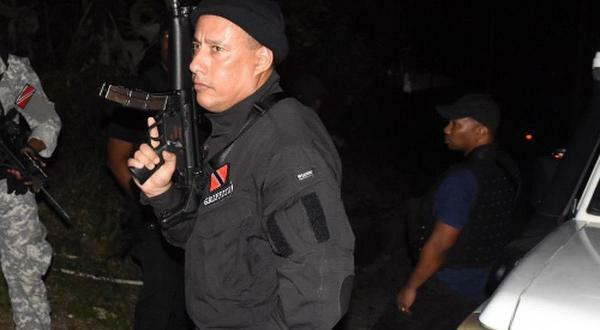 Next week, Guaya will face Trinidad and Tobago’s top club at present, DIRECTV W Connection, but the “Green Army” is not quaking in its boots. Remarkably, there is the possibility of an all-Super League final for the first time in this or any top flight competition. Club Sando, the current top Super League team which is coached by Anthony Streete, will tackle Defence Force in the other semi-final match after already seeing off Police FC and Caledonia AIA in the earlier rounds. It is a sure sign of the of the untapped ability within Trinidad and Tobago’s lower leagues and the respective clubs would do well to tie up the long-term futures of the likes of versatile 22-year-old midfielder Anthony Parris, holding midfielder Devon Drayton, playmaker Ryan Fredericks, winger Devon Modeste and striker Teba McKnight (all Club Sando) or striker Carlon Huges, defender Sherlon Campbell and wingers Jody Allsop and Jagdeosingh (Guaya). The Guaya central midfield partnership of captain Ryan Stewart and Leston Paul arguably belongs in a different class altogether. 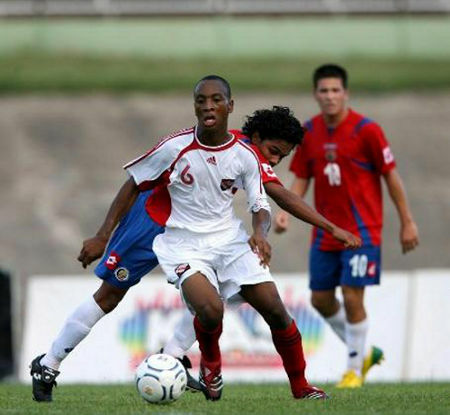 Photo: Guaya midfielder Leston Paul captained Trinidad and Tobago at the 2007 and 2009 FIFA World Youth Cups. “That is the best midfield partnership in the country right now,” said La Forest. Physically powerful, quick feet, precise passing ability and strong tacklers, Stewart and Paul have ruled middle earth in every fight thus far. In the round of 16, Stewart and Paul bamboozled the North East Stars duo of the burly Jeromie Williams and the athletic Jayson Joseph. Yesterday, Point Fortin went with a trio of Nickolson Thomas, Kelvin Modeste and Andrei Pacheco and still could not dominate the engine room. 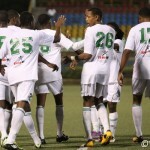 Connection selects its midfield trio from a shortlist of Kittian Gerard Williams, Brazilian Celio Da Silva, local teenager Jomal Williams, Colombian Yhon Reyes and free-scoring “Soca Warrior” Joevin Jones and the battle of the centre circle alone should be worth the price of admission in the next round. 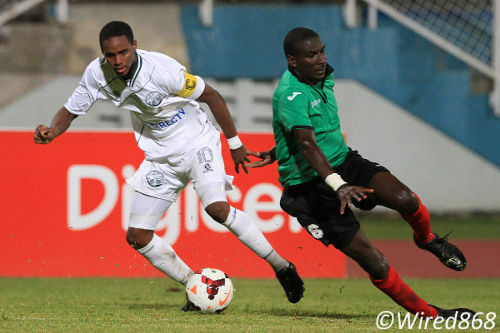 Photo: W Connection captain Joevin Jones (left) glides past San Juan Jabloteh defender Nyron Jones during a previous Pro League engagement. 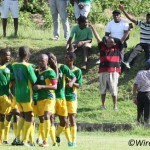 Connection president David John-Williams will certainly not hope to face the “Green Army” on a rainy day in Guaya although, yesterday, the Super League club proved to be formidable on a dry pitch in steaming hot conditions as well. 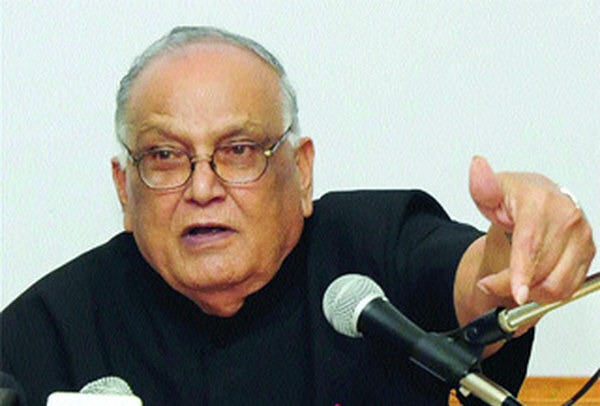 In truth, the first victory was won before kick-off. 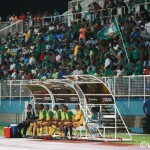 There were roughly 800 supporters at the Mahaica Oval, which was well short of the Point Fortin posse that followed Civic for the first two months of its Pro League existence. But, most surprising of all, two-thirds of those supporters were from Guaya and had their green polo shirts to prove it. The Point Fortin bubble, it seems, has burst. There was more misery for the hosts as, after just 11 minutes, Civic failed to clear from a cross and Allsop’s snap shot took a generous deflection before beating opposing goalkeeper Marvin Phillip. 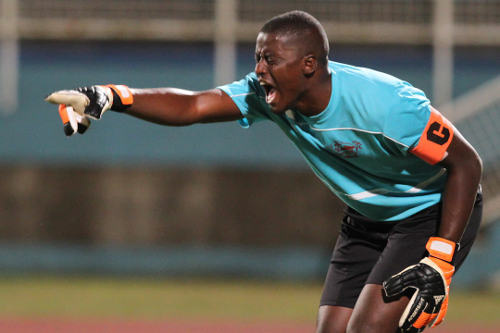 Photo: Trinidad and Tobago goalkeeper Marvin Phillip makes a point during Pro League action for Central FC last season. 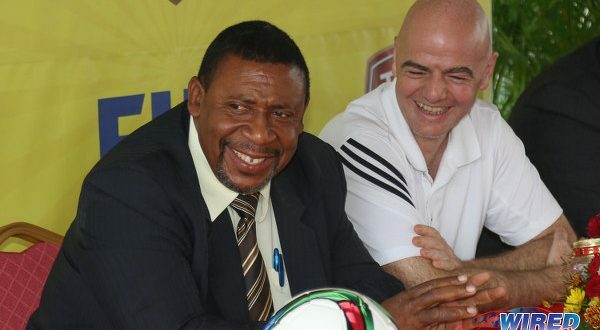 Incidentally, Phillip missed Trinidad and Tobago’s trip to Jamaica for international duty after supposing stepping on a broken bottle on the day before the Warriors left for Montego Bay. Perhaps national coach Stephen Hart might ask for a look at his doctor’s certificate. Civic might have equalised in the 20th minute as Pacheco chested down a Garryl Doldron cross and rifled a shot off the inside of the post while, seven minutes later, Civic winger Sylvester Teesdale’s effort was cleared off the goal line by Campbell. 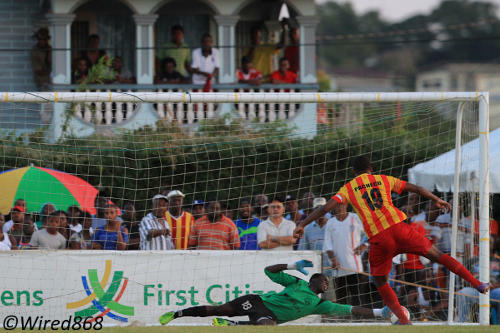 But Guaya goalkeeper Kevon Saunders still had not made a save at the end of the first 45 minutes as the south east Trinidad club, with La Forest barking orders from the sidelines, was almost flawless as its players pressed high up the pitch, marked close and made it impossible for Civic to get any rhythm. But La Forest’s sharp tongue and failure to appreciate his borders, in more ways than one, led to Guaya’s first setback in the 39th minute. 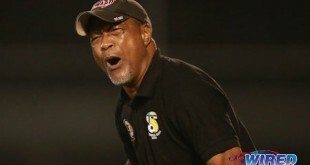 Photo: Guaya coach Ron La Forest has done wonders with the Super League team this season. 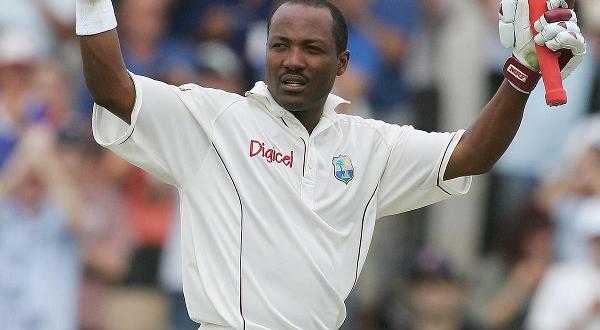 He was not nearly as successful with fourth official Cecile Hinds yesterday. Not surprisingly, Hinds was not amused and referee Rashby McPhie ordered the Guaya coach to watch the remainder of the match with the team supporters. Whether it was La Forest’s absence or the weather, Guaya’s energy dipped slightly in the second half and Civic began to make more frequent inroads into opposition territory. By the hour mark, Guaya right back Leroy Jones was cramping up, central defender Beville Joseph could no longer cross the half line with his goal kicks and Huges pressed the opposing defence only sporadically. Civic just needed a break. But Lady Luck was wearing a green jersey. Pacheco hit the post for the second time in the 72nd minute with a header from a Marcus Joseph corner kick. While Joseph turned Guaya right back, Jones, inside out before being hauled down in the 77th minute. McPhie, who had an impeccable game up to that point, whistled immediately and sprinted over to where Joseph lay on the ground. Photo: Point Fortin Civic player Andrei Pacheco’s drives a penalty past W Connection goalkeeper Julani Archibald during a First Citizens Cup fixture at Mahaica Oval. But Pacheco could not find the back of the net against Guaya. The Civic attacker had not moved an inch following the infringement and he was clearly a foot inside the Guaya penalty box. But, as hundreds of Guaya supporters offered loud, unsolicited advice, McPhie gave a free kick on the edge of the area instead of pointing towards the penalty spot. Civic coach Reynold Carrington sent on Andre Alexis in the 79th minute to join the largely ineffectual Andre Toussaint upfront and he immediately had two glorious chances to equalise. 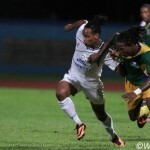 But the dreadlocked striker kicked the air when he tried to volley a Steven Joseph cross in the 81st minute. And then it was Alexis and not the ball that ended up in the back of the net as he bizarrely mistimed his diving header after flinging himself at an Ancil Wells cross. 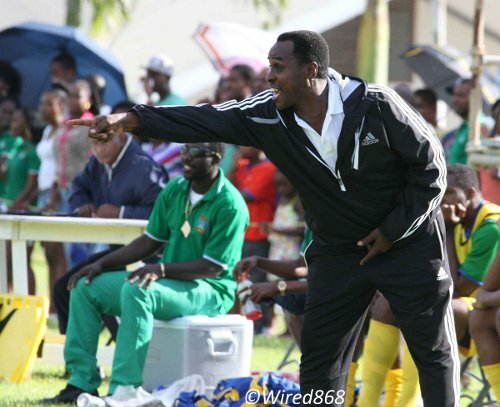 Guaya assistant coach Calvin Hughes replaced Huges with Kheelon Mitchell and sent Jagdeosingh upfront. 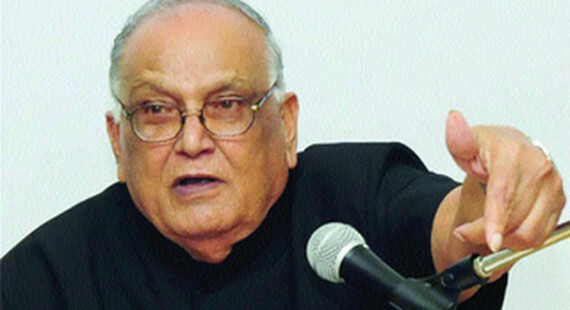 And that was the change which finally broke Civic’s resistance. Stewart collected the ball in space on the counter attack and exchanged passes with Allsop and then threaded the ball perfectly into Jagdeosingh’s run. And Jagdeosingh stabbed past Phillip for his third goal of the Classic competition. There has not been such ecstasy among green-shirted supporters since the Chaguanas West by-election. But this was about beautiful sport and not dirty politics. “Win, lose or draw,” said La Forest, “our fans are behind us all the way. This is for them. Connection will face the wrath of Guaya next. Or maybe it will be the other way around. Guaya United (4-4-1-1): 1.Kevon Saunders (GK); 77.Leroy Jones, 19.Beville Joseph, 14.Sherlon Campbell, 5.John Stewart; 4.Kevin Jagdeosingh, 17.Ryan Stewart (captain), 18.Leston Paul, 7.Jody Allsop; 9.Earlon Thomas (6.Zavio Navarro 69); 10.Carlon Huges (27.Kheelon Mitchell 87). Unused substitutes: 80.Marius Des-Cartes (GK), 2.Marcus Ramkhelewan, 3.Akeil Alvarez, 8.Kerdell Alfred, 70.Kheelon Ferrier. Point Fortin Civic (4-1-4-1): 1.Marvin Phillip (GK); 2.Garyl Doldron, 5.Andre Ettienne, 4.Weslie John, 13.Ancil Wells; 7.Nickcolson Thomas; 20.Sylvester Teesdale (8.Steven Joseph 62), 6.Kelvin Modeste (captain), 19.Andrei Pacheco (21.Andre Alexis 79), 10.Marcus Joseph; 11.Andre Toussaint. Unused substitutes: 26.Miguel Payne (GK), 3.Lyndon Diaz, 15.Keron Neptune, 18.Akeem Redhead, 29.Kevin Rouse. FB User 2876 on FIFA/Concacaf delegation meets TTFA Board as concerns grow; but are they here to help football? Or DJW?